This entry consists of excerpts from "The Grey Havens" recounting Sam and Frodo setting out from Hobbiton. In the Woody End, they meet Bilbo and the Elves and turn West, riding together to the Grey Havens on the Gulf of Lune. Nothing from this scene made it into the film, which I thought was a shame. 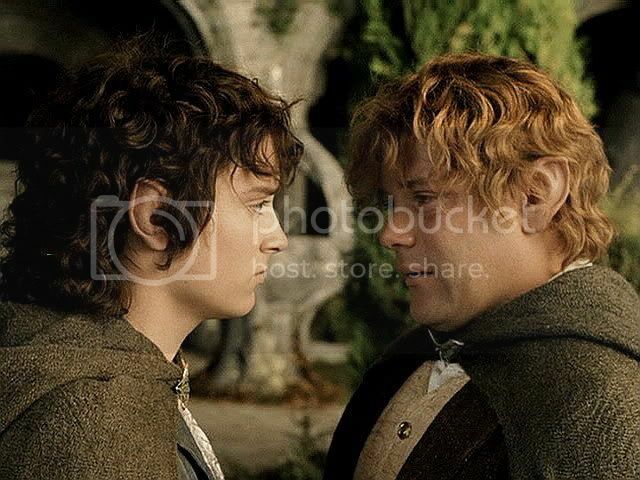 It is in this scene that Sam learns what Frodo intends to do. 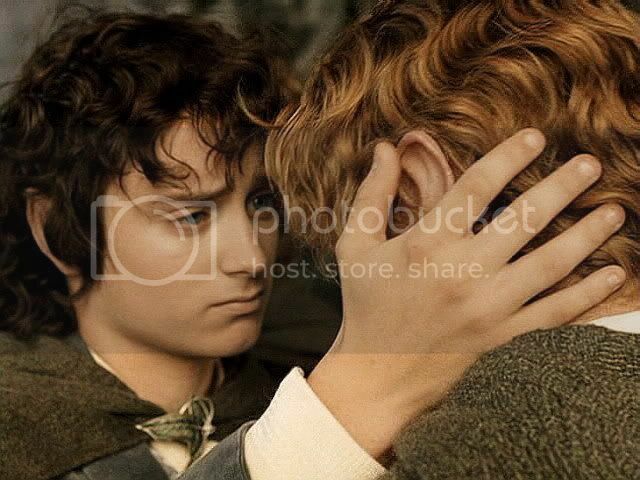 Whether Sam has guessed all the time, underneath his persistent denial of Frodo's continued mysterious malaise, the sudden reality of it comes as a shock. 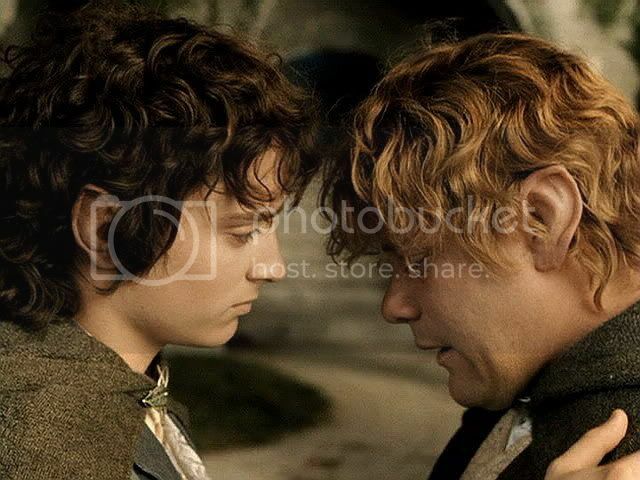 It is in this scene that Frodo tells him he has made Sam his heir and why. 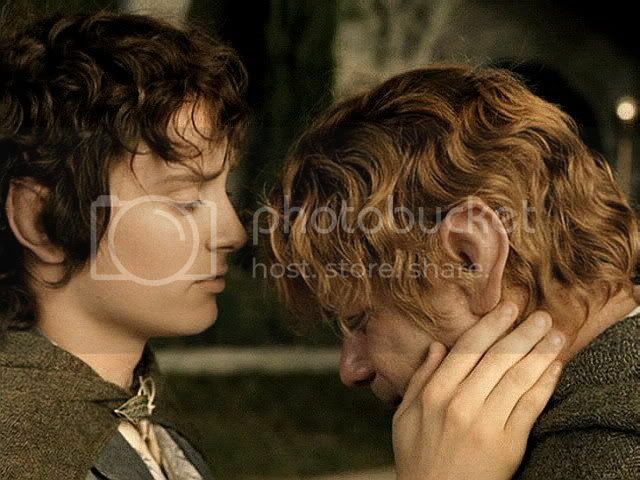 And it is in this scene that Frodo attempts to console Sam, telling him his life-filled vision for Sam's future. 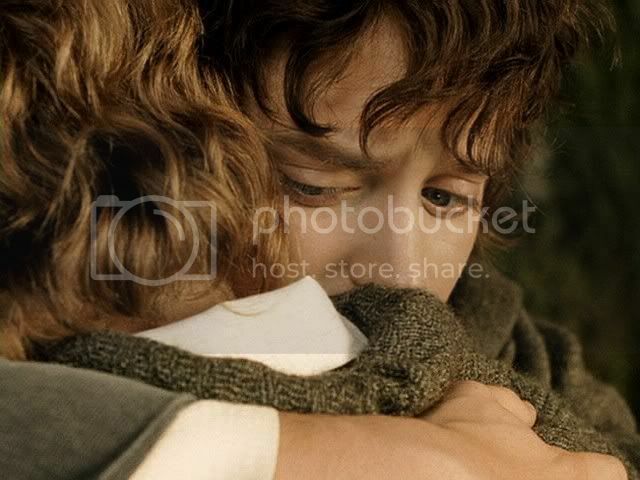 Even though Sam and Frodo's real “goodbye scene” comes here rather than down at the Havens in the book, I have used screencaps from the film’s farewell to illustrate this entry, instead. And, as usual, all the caps have been tweaked for contrast, lighting and focus. The caps come from the full-screen version of the theatrical release. Side note: Re-reading this passage, it struck me how different Bilbo is in the book, compared to the film, in terms of aging. 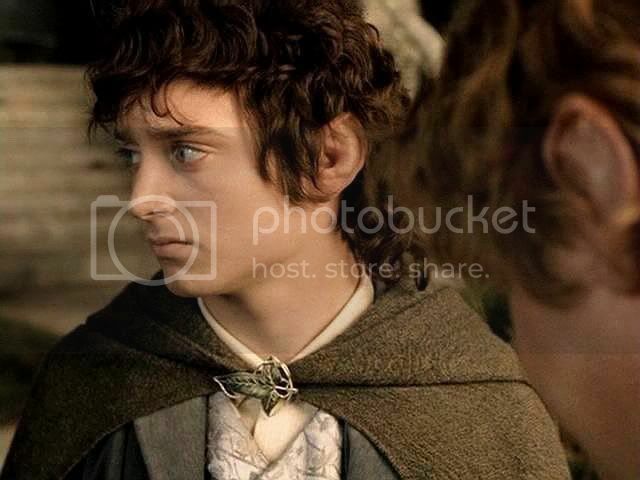 The films gave me a Bilbo I loved, and the writers had their reasons for making him so enfeebled, but book-Bilbo is still quite fit (even if a bit removed and forgetful). A hobbit who can sit a pony all the way from the Misty Mountains to the Sea is *not* decrepit. 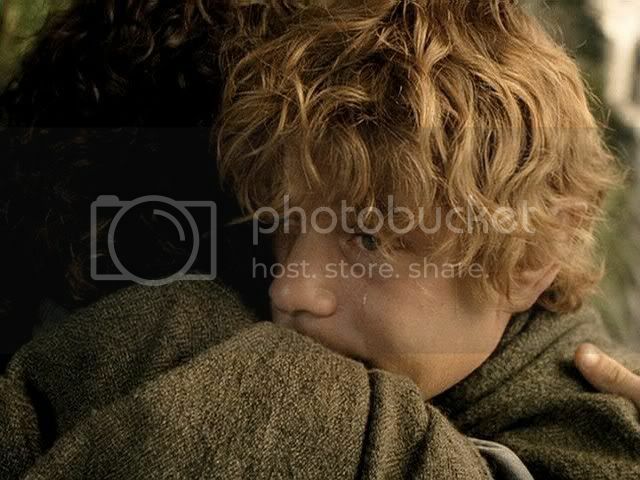 On September the twenty-first they set out together, Frodo on the pony that had borne him all the way from Minas Tirith, and was now called Strider; and Sam on his beloved Bill. It was a fair golden morning, and Sam did not ask were they were going: he thought he could guess. They took the Stock Road over the fills and went towards the Woody End, and they let their ponies walk at their leisure. They camped in the Green Hills, and on September the twenty-second they rode gdently down into the beginning of the trees as afternoon was wearing away. It was evening, and the stars were glimmering in the eastern sky as they passed the ruined oak and turned and went on down the fill between the hazel-thickets. Sam was silent, deep in his memories. 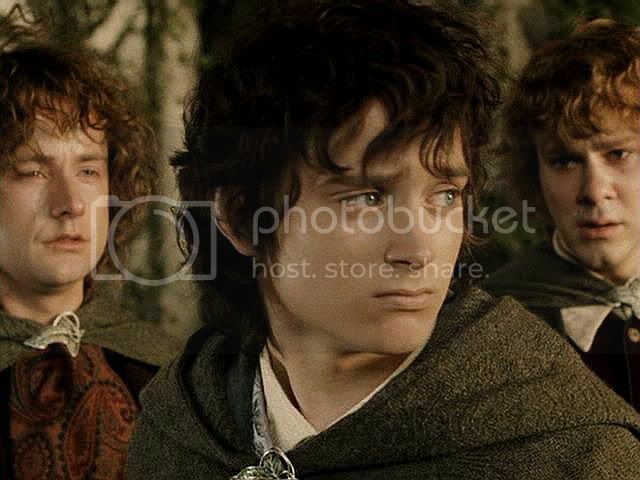 Presently he became aware that Frodo was singing softly to himself, singing the old walking-song, but the words were not quite the same. 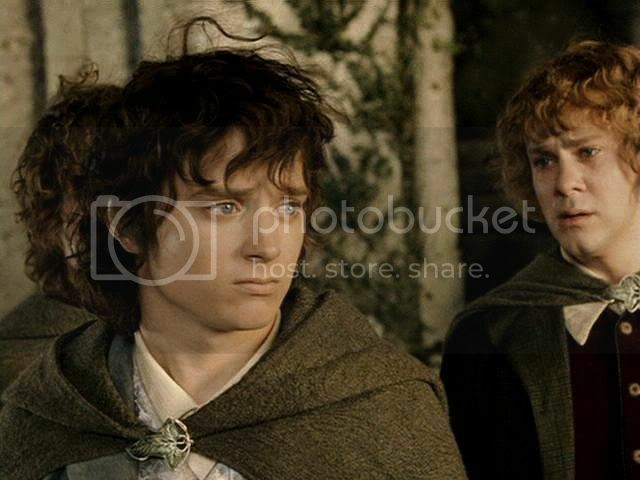 Frodo and Sam halted and sat silent in the soft shadows, until they saw a shimmer as the travelers came towards them. There was Gildor and many fair Elven folk; and there to Sam’s wonder rode Elrond and Galadriel. 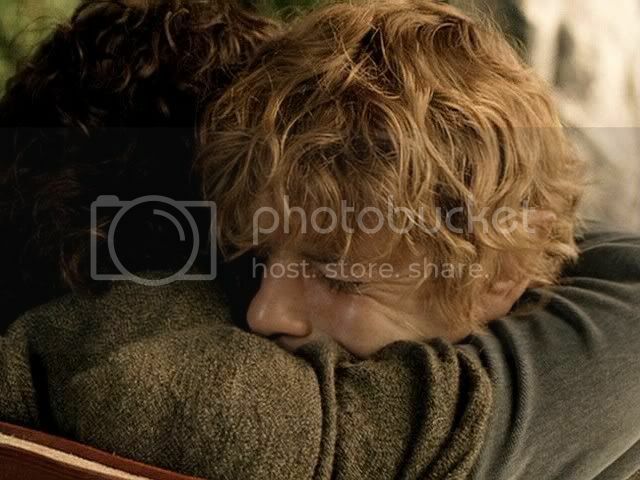 […] Riding slowly behind on a small grey pony, and seeming to nod in his sleep, was Bilbo himself. Elrond greeted them gravely and graciously, and Galadriel smiled upon them. 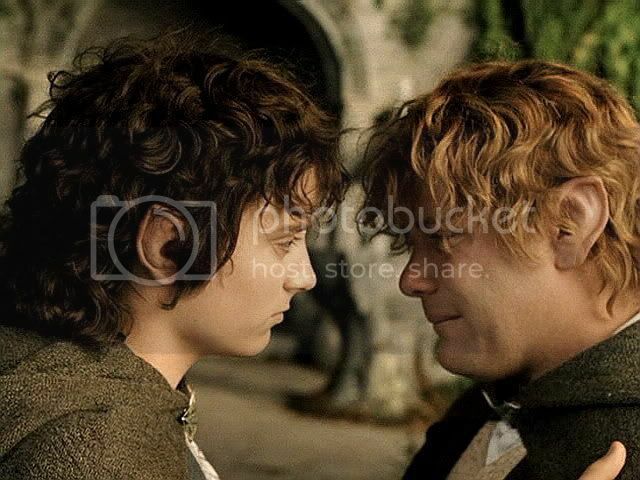 ‘Well, Master Samwise,’ she said. ‘I hear and see that you have used my gift well. 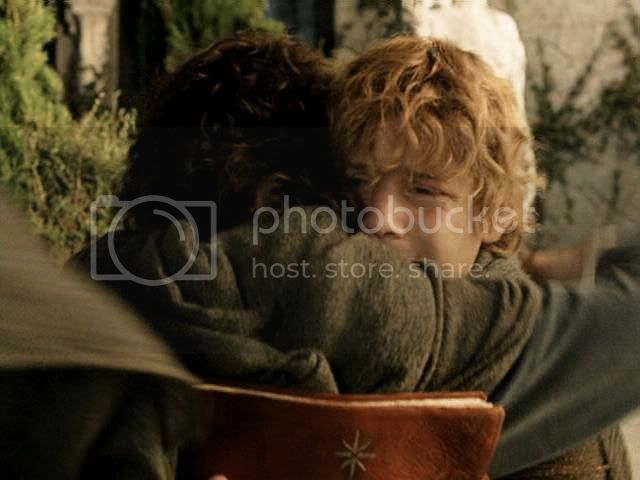 The Shire shall now be more than ever blessed and beloved.’ Sam bowed, but found nothing to say. He had forgotten how beautiful the Lady was. ‘So I thought too, once. But I have been too deeply hurt, Sam. I tried to save the Shire, and it has been saved, but not for me. It must often be so, Sam, when things are in danger: some one has to give them up, lose them, so that others may keep them. But you are my heir; all that I had and might have had I leave to you. And also you have Rose, and Elanor; and Frodo-lad will come, and Rosie-lass, and Merry, and Goldilocks, and Pippin; and perhaps more that I cannot see. Your hands and your wits will be needed everywhere. 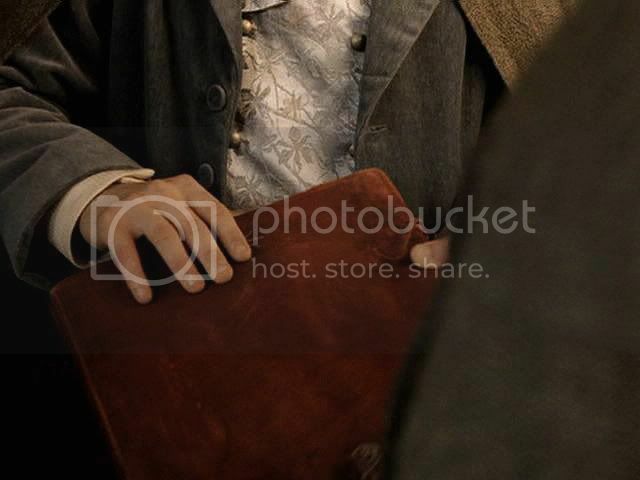 You will be the Mayor, of course, as long as you want to be, and the most famous gardener in history; and you will read things out of the Red Book, and keep alive the memory of the age that is gone, so that people will remember the Great Danger and so love their beloved land all the more. And that will keep you as busy and as happy as anyone can be, as long as your part of the Story goes on. Previous entry, “Elanor is Born, Pt. II” HERE. 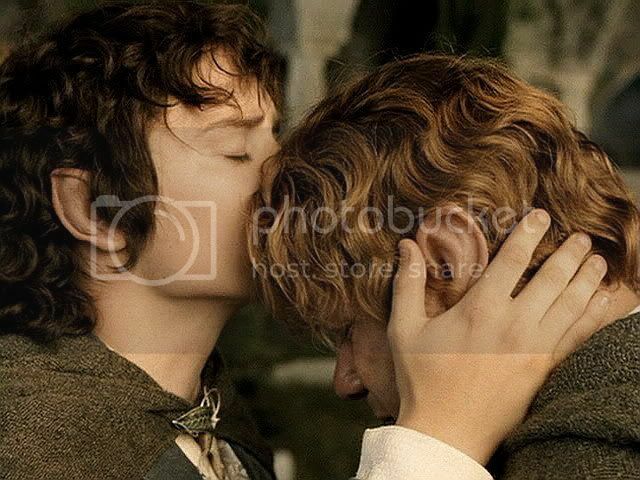 Next entry (At the Havens - Frodo farewells Merry and Pippin) HERE. You're welcome, Mews. It's a gorgeous book scene. I suppose I am sort of compensating, if just for me, by borrowing the film images to illustrate it, even if they didn't. Such a heartbreaking scene! And yes, what a shame more of the 'backstory' wasn't brought out. My father, who never read the books, didn't understand why the Elves were forcing Frodo to sail West with them. 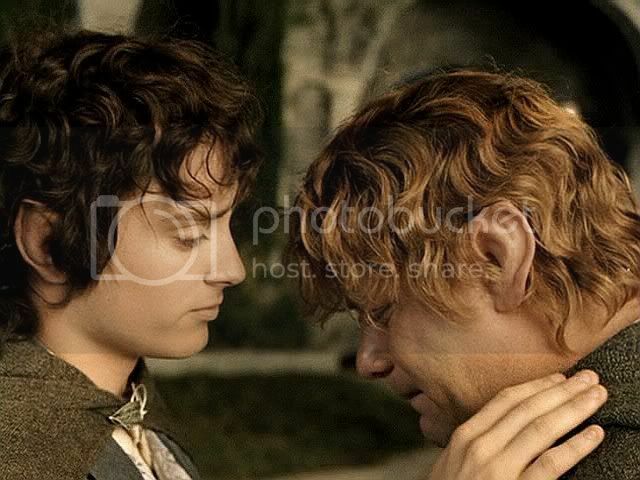 It really wasn't explained fully that Frodo had weighed other options, and come to his own decision. But what they *did* choose to show in the film was exquisitely photographed and acted. Yes, a number of "book virgins" wondered why Frodo was shipping off. He only had a pain in his shoulder and seemed a little down in the dumps, after all. Perhaps they really could not find their way to making it happen on camera, esp. if they wanted to make it a "one film pleases all" film. But, yes, the scene they did include was beautifully done. This scene is always killing me, although it is so different from the book. I love both the movie and the book versions. I am in Sam's skin watching this scene. It hurts so much to see him go. gosh, i knew i shouldn't have looked at these yet and killed myselt thousand times over. It really was a beautiful scene. I appreciate it all the more, having pored over it making screencaps. I just needs the music! 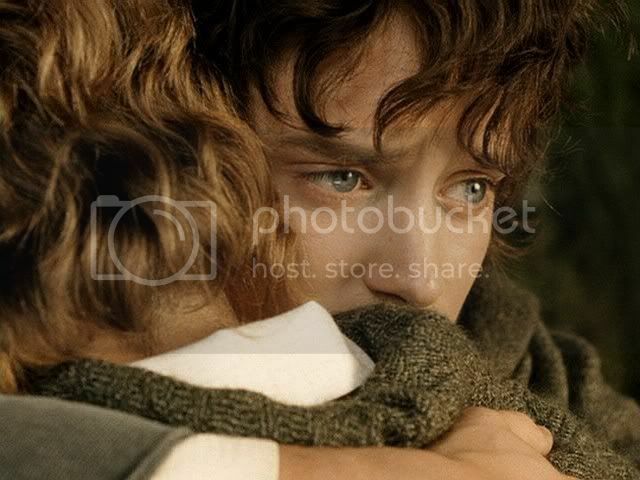 One of the most touching scenes in the trilogie, it always makes me cry. Very emotional and heart-rending *sigh*. Thank you sweetheart for those wonderful screencaps, bringing back sweet memories. Yes, those were great lines. I wish so much they had found a way to include them, although the time the camera lavished on the emotional farewells, with no words spoken at all -- and Howard Shore's heartbreaking scoring playing beneath it -- did a lot to make up for the lack of those lines. Thank you Mechtild! These are such beautiful images. Yeah, "good". Your husband's comment makes me smile. 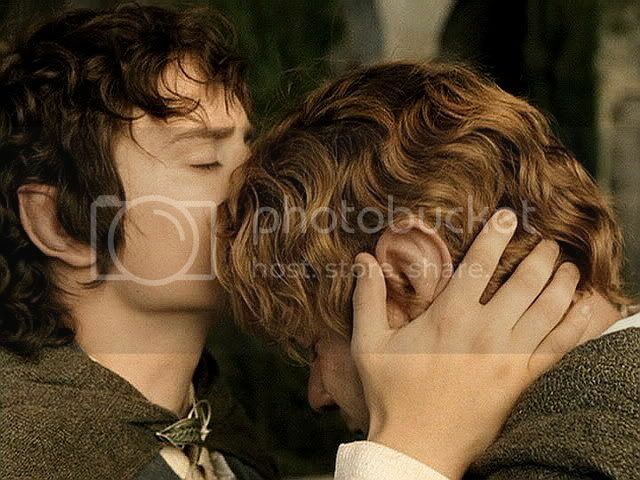 "Getting soggy over hobbits". Could have more than one meaning, too. Sometimes hubbs gets English a bit muddled but it is soooo endearing. He has said *a little bit of how’s your uncle * instead of how's your Father * Hilarious. Perhaps I should write a book about Hubby’s hilarious humour. I would probably make a fortune. Oh, that was funny! You know, even English and Americans make each other laugh. I know we children always tittered when my mother (British) would say, "keep your pecker up." And later, after I knew more about "buggery", it used to crack me up that she was always telling someone to "bugger off" or calling us "cheeky buggers". Obviously, she was using it in a different way.